Responding to requests for a robot that had the speed and payload of X80 with the development versatility of the DRK8080, we built Sputnik, a robot with the complexity expected of a research tool, but the simplicity of use required by hobbyists and enthusiasts. 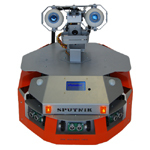 In addition to all the features offered in the model X80 robot, included with SPK-1 are software modules enabling remote access and control of the robot via Internet protocol. For home users, this means the ability to navigate and monitor the robot’s surroundings remotely. Other software elements permit remote listening through the robot’s microphone as well as two-way verbal communication through the robot to a remote user. Like its cousin the X80, Sputnik is a balance of speed and strength with portability and precision. 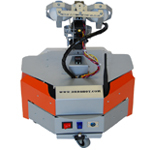 The wheel-based platform’s two 12V DC motors each supply 300 oz.-inches(22kg.cm) of torque to the robot’s 18 cm (7 in.) wheels, yielding a top speed in excess of 1 m/s (3.3 ft/s). Two high-resolution (1200 count per wheel cycle) quadrature encoders mounted on each wheel provide high-precision measurement and control of wheel movement. Weighing only 6.1 kg (13.5 lb. 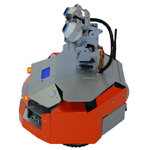 ), the system is light, but it can carry an additional payload of 10 kg (22 lb.). Sputnik offers full WiFi (802.11g) wireless, multimedia, sensing and motion capabilities and comes with a wide range of sensor, camera, and audio modules, sufficient to serve in any variety of applications. 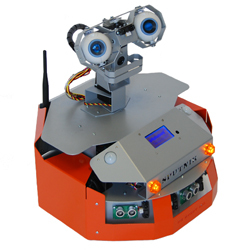 The robot offers broad expandability as well for projects that may require additional sensors, even specialized modules. Powered by separate RC servo motors, the integrated camera head can pan and tilt independently. The technology underlying Dr Robot's WiFi robots evolved from its Distributed Computation Robotic Architecture, originally developed for Dr Robot’s Humanoid (HR) Robot. Using this approach, high-level control of the robot is maintained by a remote or local PC/server communicating by a secure wireless link. Low-level functionality is managed by an onboard digital signal processor (DSP) while computationally intensive operations are performed offboard. The result is a robot that’s lighter, draws less power, runs longer and is dramatically less expensive than a fully bundled or self-contained system. Moreover, since primary processing resides in a server, any hardware upgrades to the central unit are shared by all the robots it controls. With its integrated high bandwidth (11Mbps) WiFi 802.11 wireless module, the SPK-1 series robots can upload all sensor data (including encoder sensor readings) to a PC or server at rates in excess of 10Hz. Similarly, streaming audio (8KHz 16bits) and video (up to 4 fps) either for direct monitoring or for processing by high-level AI schemes is a snap. Commands and instructions sent to Sputnik via the same wireless link also pass at rates exceeding 10Hz, providing real-time control and access. Sputnik includes all WiRobot development software components (for MS Windows 2000 and later), enabling easy access to all data and information in a standard Microsoft Windows programming environment (e.g., MS VB and VC++). Under the approach of using a separate PC for high-level control, there are no longer onboard restrictions on a mobile system’s processing power, memory and storage. For users of non-Windows operating systems (e.g., Linux), Dr Robot will provide the raw communication protocol for direct integration with any other system/device. With Sputnik, researchers are free develop a raneg of specialized intelligent robotic assistants or service units, or simply use it as a platform for projects built around applications such as human-machine interaction, mobile system navigation, robot behavior, image processing, object recognition, voice recognition, teleoperation, remote sensing, map building and localization etc. Each robot is fully integrated and each robot is fully assembled and tested prior to shipping so that it arrives ready for use. Pre-programmed fine speed and position control achieved by an integrated PMS5005 module employing two 1200 count per wheel-cycle quadrature encoders. Fully integrated WiFi (802.11g) system with dual serial communication channels (max of 912.6 Kbps per channel), supporting both UDP and TCP/IP protocol. Battery: 2 10-cell 12V 3800mAh battery packs with over 3 hours for nominal operation and stand-by time over 8 hours. Additional sensors such as supplementary sonar sensors, temperature sensors, acceleration/tilting sensor, or customized sensors can be added.